Just like in our homes, it’s important to have individual spaces for different uses. There are different and distinct rooms for eating, cooking, sleeping, and relaxing. The same can be done with your outdoor living area as well. At this Leawood KS home, we worked together with the homeowners to build a screen porch flanked by two AZEK decks and a pergola. Each of these spaces fulfilled the need for different types of outdoor living. Equally as important, family members and friends could enjoy time simultaneously in the different areas doing different things. 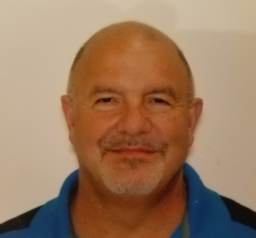 For example, someone could be inside the screen porch reading while another person or small group are gathering on one deck area and another person is separately grilling on the other deck area. See more screened in porch ideas for your home! Because this was a one-story home, the porch had a roof connection to the home. Based on the placement of the porch, a new connection was made from the home to the porch. We carved out a large entrance area and installed custom-made doors by Pella. The screen porch adjoins the great room in the home so it’s a nice extension of the great room. This allows the owners to keep the doors open depending on the temperature and allow air flow through the porch into their home. Leawood KS screen porch with custom Pella door entrance. The 18′ × 14′ porch’s interior has a custom tongue-and-groove cedar ceiling. 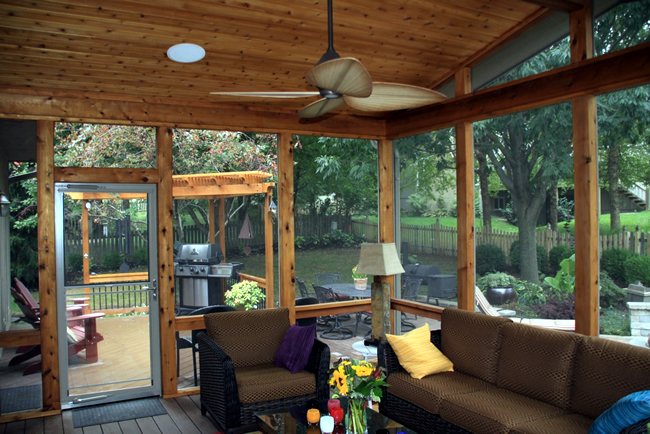 The screen porch is designed to allow for a good air flow. Instead of a knee wall, divider walls were used to allow air flow under the divider rail. The gable is open to allow screens for air flow. And finally there is a large ceiling fan to increase the air flow. 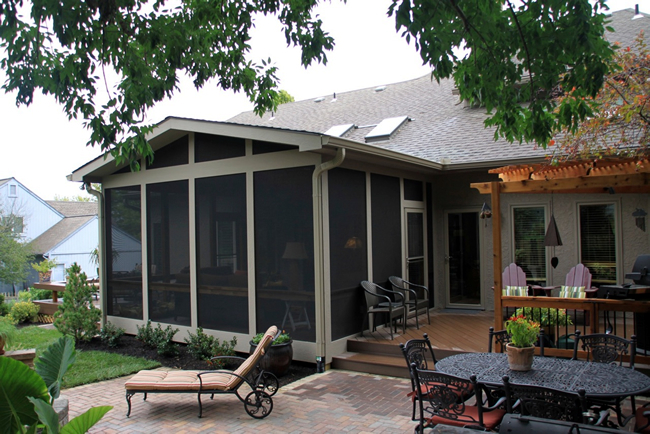 See more Leawood KS screened porches! 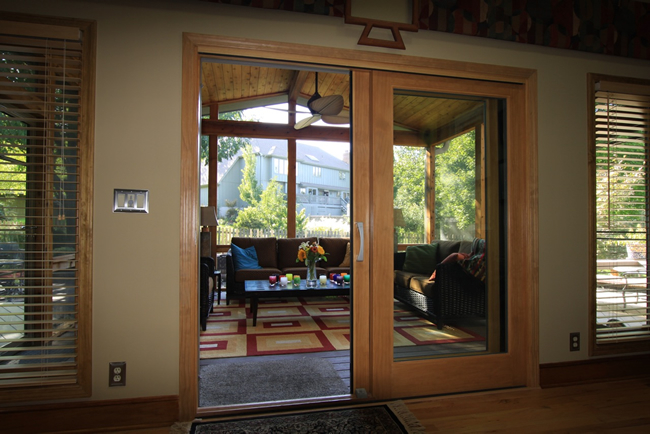 Another thing that’s very important to consider is entrances and exits from your outdoor room. This screen porch has three. There is an exit to the decks on both sides and the entrance to the home as well. Both of the decks are built with AZEK acacia low maintenance PVC decking. The Acacia colors compliments the home’s subtle hues and is also quite popular right now. The seating deck not only has room for a large seating area but also has built-in benches for more seating. The deck is low to grade so no railing is needed but the benches add a nice natural rail area where the landscape would prohibit a walk down to the back yard. This deck also is nicely finished with a lattice skirting. The AZEK deck on this side of the porch includes built-in benches and lattice skirting. The deck on the other side of the home can be used for seating and eating and also has the cooking area. In the corner, a pergola surrounds the grilling area. Along with the patio, the family essentially now has 4 outdoor rooms in which to live, dine, relax and enjoy. Read about composite decking materials improvements through the years! AZEK deck with pergola and eating area. As you can see, every design is as different as every home. But the design considerations for your outdoor structure will take a good bit more into account than the aesthetics. We will spend time with you identifying how you want to live outside. How many people do you expect will be spending time in each space? How often? How are you going to live in those spaces? Is it going to be an eating area and how large is your furniture? These are just a few of the questions we will ask you when we meet for a free consultation. 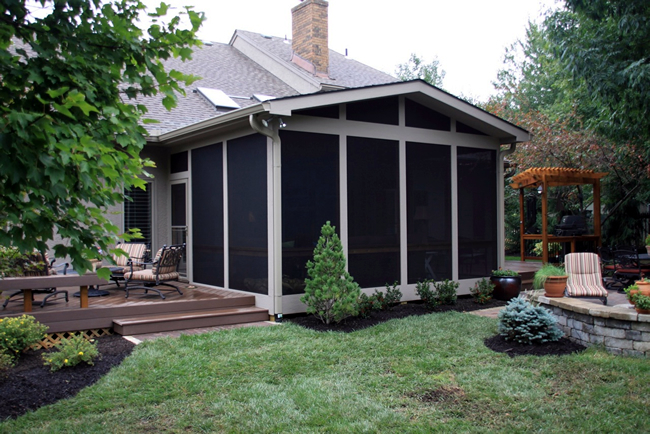 If you are considering adding a custom screened porch to your Kansas City area home, give us a call for a free consultation at (913) 851-3325 or drop us an email. We look forward to working with you to design the perfect new outdoor living space for your home.